Located in the heart of Florence in historical Borgo Pinti, Hotel Monna Lisa is within easy walking distance of all of Florence’s main sights such as the Santa Maria del Fiore Cathederal, Santa Croce Basilica and Giotto’s Bell Tower. 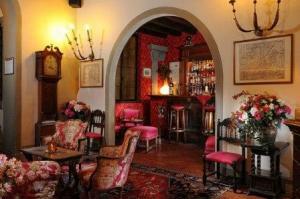 You are also within walking distance of the array of shops, markets, bars and restaurants that Florence has to offer. Monna Lisa boasts a bar (open until 11pm daily), a gym and a veranda as well as lush gardens, which are magnificent during the summer months for a relaxing stroll or a drink. There is a buffet breakfast served daily until 10 am, a 24 hour reception and concierge service and parking on site should you wish to arrive by car. Of the hotel’s 45 rooms, several have their own balconies which overlook the gardens. All of the rooms are furnished in a traditional Italian style with antique furniture and all have air-conditioning, satellite televisions and a mini-bar. 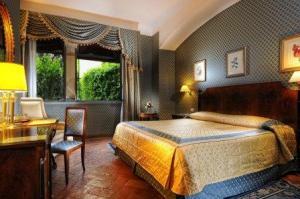 The four grades of room are Classic, Superior, Junior Suite and Suite. Junior Suites and Suites are equipped with a Jacuzzi and also have a separate living room area.